Gary Sanchez admiring one of his homers. @Yankees. The Yankees were 6-0 at home in last year's playoffs and won the Wild Card Game at The Stadium Wednesday night, so it is a realistic possibility that they can close it out at home and not have to return to Boston. 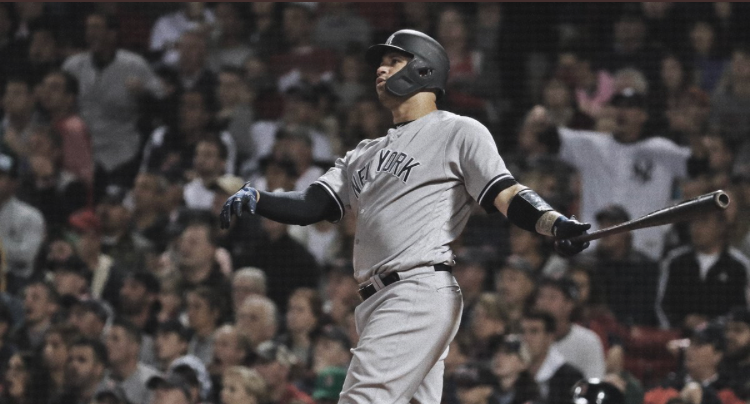 It didn't take long for the Yankees to set the tone in this one against Boston starter David Price, who they have been very successful against this season. Yankees Manager Aaron Boone said of the Gardner walk being the pivotal moment in terms of knocking Price out of the game, "It was a really good at-bat. You know you're always going to get that with Gardy. Even at times where it's been a little up and down for him, that he just has a way of grinding out an at-bat and making the pitcher really work. Obviously that was a big at-bat and just kind of setting things up again, and adding on a little bit there early." Price, whose final line was 1-1/3 innings, three runs on three hits and and two walk, and no strikeouts, said of his performance, "It's tough. You know, just after we won Game 1 to go out there and have that opportunity to go up 2-0. And to throw the baseball the way that I did, it was definitely tough. But my spirits aren't down, my confidence isn't down. I'm looking forward to getting back out there and getting another opportunity." On if he was surprised to get the quick hook, Price said, "It's the playoffs. You see it happen all the time, especially over the past couple of years. Managers go into bullpens extremely early. If I don't like it, I need to pitch better, period." Red Sox Manager Alex Cora said of Price's troubles, "Location. 0-2 or 1-2, back-door cutter to Judge leaves it over on the middle of the plate. Back-door cutter to Sanchez, he was leaning out over the plate and he extended. And McCutchen got on top of a fastball. "It's all about location. We can elevate, we've been talking about the whole season, when it's in the same plane. It seems like the velocity was very in the same range as far as like his pitches, they take advantage of it." Yankees starter Masahiro Tanaka was cruising until the fourth when Xander Bogaerts homered to center field to get Boston on the board and cut the Yankees' lead to 3-1. Boone said of Tanaka, "Masahiro was terrific. Set the zone. Really efficient with his pitches. Mixing early. Command. The Red Sox, they do a really good job of putting the ball in play, and they can be a tough out, especially even when he's got his split. But it was five strong innings for us to really set us up in a good position, and fortunately we were able to add on once he got out of there." Sanchez said of his and Judge's homers, "I mean, everybody knows that Judge has way more power than me. You know, I don't have to tell that to anybody. But a homer is a homer. And if we have the opportunity to score runs like that, you know, even if it's 300 feet, I'll take it. Anytime we score and we're helping the team, I'm going to take those." Boone said of Sanchez's big night, "Yes. We know he's capable of that. And you know, first three games into the playoffs, too, you know, almost more importantly he's caught really well. I think he's been really good back there from the receiving, blocking, game-planning, all those kind of things. And then tonight just a monster night. You know he's capable of that. We all know he's capable of that. That's kind of what we've been waiting for to some degree where he can take over a game on offense. He was huge, obviously, tonight." Cora said of the Sanchez bomb in the seventh, "2-0 change-up, he swings and misses. We try to come in and he missed right down the middle. Sanchez is a guy that fastballs down in the zone he crushes. He didn't miss that one." Sanchez said of keeping his confidence up through his troubles on offense and defense, "Well, you know, I always stayed positive throughout the whole season. I know it was a rough season for me. It was a tough one. But you know that's the regular season, and that's done. We're done with that. Now we're playing the really exciting baseball. So to have an opportunity now to keep on playing and produce at this time it's actually more important. And, you know, just keep on working and once the offseason comes, try to improve in all aspects."